Come learn some interesting things about our community and enjoy some ice cream at the same time! The History and Art of Gladding McBean Ice Cream Social will be July 20, at 965 Orchard Creek Lane Lincoln, CA 95648. There will be a special presentation by The Art League of Lincoln and Jean Cross, the first woman sculptor employed by Gladding McBean and current artist in Residence. The Art League is working to bring Feats of Clay, the celebration and exhibition of ceramic art (held 1988-2011) back to our community. Tickets and more information available at www.all4art.net. Art League of Lincoln 580 Sixth Street, Lincoln, CA 95648. W – Sat. 11:00am- 3:00PM. Art has many benefits on the human mind. We may not consider ourselves artist but everyone can create their own art in some form or another. It doesn’t have to be for anyone but yourself. Here are just some the ways that creating art is good for your mind, body, and soul. Anytime you participate in a new or complex activity, your brain creates new connections between brain cells. Creating art stimulates communication between certain parts of the brain. So creating art has been proven to increase psychological resilience and resistance to stress. Art Raises Self-Esteem and Produced a Sense of Accomplishment. Many parents stick their kids’ artwork on the refrigerator door to boost their self-esteem. Hanging your own artwork on the wall can instill self-esteem and a sense of accomplishment in yourself. Creating art through painting, drawing, sculpting, and photography can help to lower your stress and anxiety. They can help you feel good about yourself and leave you with a clear and calm mind. Art Produces a Creative Mind. Creating art strengthens problem-solving skills. There is no correct answer, it is up to interpretation of each individual. Art allows you to come up with your own unique solutions. Thinking outside of the box stimulates your brain to grow new neurons. Art Makes Better Students for Life. Parents and educators have suspected that music and art programs make better students and now there is neuroimaging to back this up. Art lessons have been shown to increase brain plasticity, intelligence, and attention span. Art also can improve overall behavior and reduce impulsiveness. Art Helps Relieve Chronic Health Conditions. Art allows patients to forget about their illness for a time and lets them focus on creating. Creating gives patients a sense of achievement. Art helps to reduce stress by actually lowering the stress hormone cortisol in the body. Creating art can help patients retain their sense of self. Art is great for your mind, body, and soul. It is important to take care of yourself and part of taking care of yourself is having a clean and comfortable living environment to call home. It is recommended that you have your carpets professionally cleaned at least once a year. 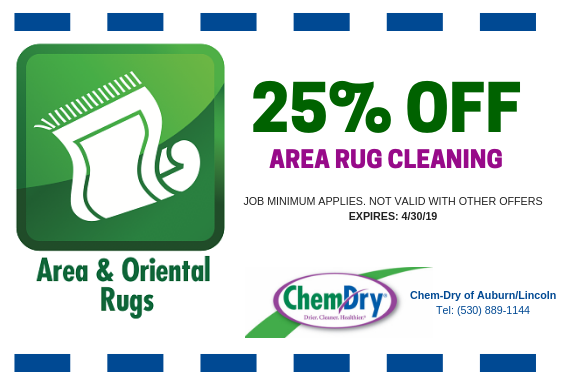 Chem-Dry of Auburn/Lincoln provides outstanding carpet cleaning services throughout Auburn and Lincoln California. Over time dirt, dust, allergens, hair, oils, and stains can become embedded into your carpet. 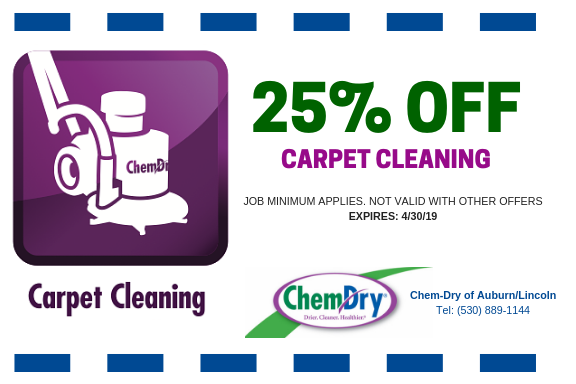 Chem-Dry Auburn/Lincoln’s technicians are trained to bring new life to your carpets and remove even the most difficult of stains. We use the most innovative equipment and our powerful yet natural cleaning solutions. Other carpet cleaning services use soaps and chemicals to attempt to clean carpets. 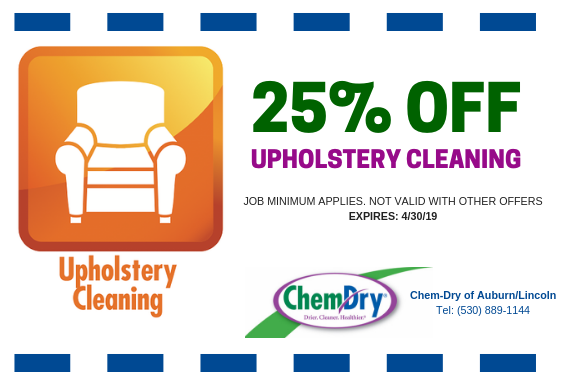 Chem-Dry Auburn/Lincoln uses only eco-friendly and green-certified cleaning solutions making it the healthiest choice especially for homes with children and pets. Soaps left on carpet will turn into a sticky residue that attracts dirt and dust and leads to discoloration. In an attempt to rinse the soaps out, other services waste gallons of water and are still rarely successful in removing all the soap.Moisture left on carpets leads to mold and mildew growth. Chem-Dry Auburn/Lincoln uses very little water since we do not use any soaps. 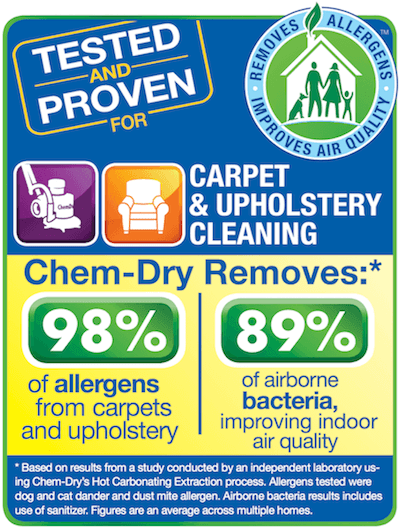 For the drier, cleaner, healthier carpet cleaning service call Chem-Dry Auburn/Lincoln (530) 899-1144.